Buying a car is a tough experience because there are so many to choose from. Some are super luxurious and some are made to thrill. The price could be anywhere from just thousands to millions, but finding a perfect combination of low cost and modest luxury is always tricky. Are you someone with a median income and person looking to buy a car but at a low price? 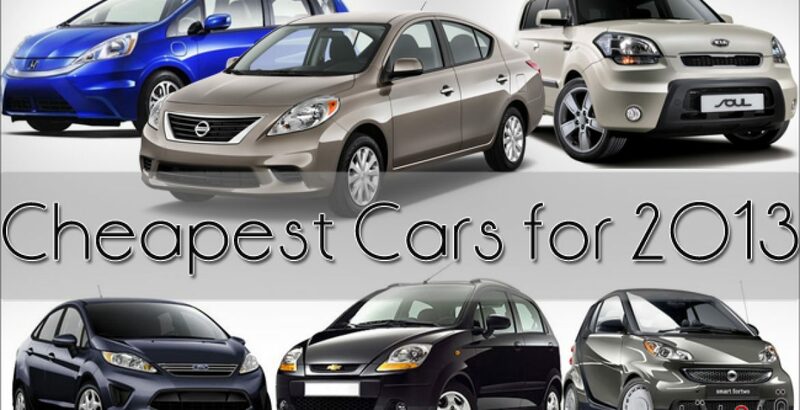 Find out all here in our list of new and least-expensive cars for 2013. Starting at a remarkable price of $11,990 and with manual transmission, there is new Nissan Versa S at the top of our list. As a Versa owner, you are sure to enjoy vibrant features spacious cabin, quiet drive and a comfortable drive. The plentiful trunk seems to be compact enough to fit anything. It has slow acceleration so you can’t see any less power in a car with same price scale. With fuel prices rising all the time, any one will be happy enough to enjoy sound driving with mini Chevrolet Spark LS starting at an amazing price of $12,245. This vehicle fits perfectly for someone who is on the go always. The car packs ten standard air bags for ensuring maximum safety and come with 5-years warranty to better compete in the market. Now don’t drive alone because here is a car to entertain you while driving. You are assured to make a fun drive with 70-HP engine paired with five-speed manual transmission. Smart ForTwo is perfect symbol of a compact car combining the amazing fuel efficiency and 48-months of warranty. Pricing starts from $12,490. The next entry comes from a subcompact vehicle that may seem to be small at a glance. Capacious from inside and trendy from outside, Fiesta S makes the way to our top ten cheapest cars for 2013. With a price starting from $13,200 the car packs great fuel efficiency, power windows/locks, power steering and chilled air conditioning. Toyota Yaris has set its’ own distinct standards from other upcoming subcompacts. It has been evolving since it first came out. Much more excitement is to be seen in the 2013 model with even more improved performance. Powered with 106-HP engine, Yaris is a bit snappy than its rivals. However don’t overlook the power, it is spacious, safe and comfortable for price starting from $14,370. SUVs makers will have to keep their eyes open for the arrival of small economical vehicles. Combining the ace design and high fuel efficiency, the car has to offer plentiful cabin and smooth drive, look to see climate control, power windows/lock/mirrors and stereo system. What makes it different from others is its ability to fit for short as well as long drives and not to mention its inexpensive cost of $14,400. Powered with 138-HP 1.6-liter 4-cylinder engine, the car looks stunning. The new Accent has been designed to meet both goals: exterior style and interior space. It appears in our top list for the maximum colors choices (9 colors) and interior space for the price of $14,545. Overall, Hyundai Accent is nice contender in the 2013 lineup. When it comes to reliability, Honda always makes a mark. The same quality and affordability comes together with new Honda Fit 2013 at a price of $15,325. The standard model comes with 5-speed manual transmission coupled with 1.5-liter 4-cylinder engine. Only looking once from inside this is the car that you will really appreciate for beauty and design. Economical, spacious and artistic, the Honda Fit is perfect for both short and long mileage. Kia Forte LX combines the crispy style and sleek look starting from $15,400. Powered with 2.0-liter 156-hp 4-cylinder engine the car does the job well with 6-speed manual transmission. The performance is yet to be worth-noticing. A surprising factor is it packs sirus, bluetooth, steering wheel control plus voice activation. The premium version includes more enhancements along with 16’’ alloy wheels. Ford Focus S is perfect if you are looking for an economical yet stylish car under a budget of $ 16,500. The car packs great tech enhancements serving a fun rich drive. The standard model comes with 2.0-liter direct injected 4-cylinder engine that produces 160-hp of torque. Sounds not bad. If you are a bit more focused on quality and performance then look for the upper models.